Important events of 1943, including the arrest of Mussolini. 4 Jan Operation Ring approved by STAVKA – Russian HQ. It entails the destruction of the German VI Army at Stalingrad, unit by unit. 10 Jan Operation Ring begins at 08.00 with a massive artillery attack on the VI Army, and, as per instructions, the German troops were hunted down unit by unit. 13 Jan Two Russian armies attack the Germans at Kharkov in the Ukraine. 14 Jan The start of the Casablanca Conference. Churchill and Roosevelt agreed to increase American bombing of Germany, and to transfer of British military resources to the Far East once Italy had been defeated. Stalin, not invited, was left out in the cold! 22 Jan The Germans evacuate Tripoli in North Africa. 31 Jan Despite being promoted to the rank of field marshal the previous day, General Paulus surrenders the southern group of the German VI Army at Stalingrad. Hitler is furious that his commander chose surrender over suicide. 9 Feb After six months of fierce fighting on land, sea and air, Guadacanal is taken by American forces. The campaign ended Japanese expansion plans and perhaps signified the turning point of the war in the Pacific theatre. 13 Feb Orde Wingate along with 3,000 of his Chindits cross the Chindwin River on their march into Burma, taking the fight to the Japanese in an attempt to disrupt their advance into India. 16 Feb Russians retake Kharkov. 20 Feb The Germans, led by Manstein, launch a counter-offensive against the Russians. 2 March Germans destroy the Russian 3rd Tank Army. 3 March Manstein masses four Panzer corps south-west of Kharkov to launch another attack on the Russians. 15 March The Germans re-capture Kharkov. 13 April The first news of the Katyn Wood Massacre was broadcast. The Germans had discovered a mass grave of 4,500 Polish soldiers in Russia. 19 April Start of the Warsaw Uprising. 7 May The German army in North Africa surrender to the British and Americans. 5 June Start of Operation Citadel; the German attempt to cut off the Kursk salient (a bulge in the Russian battle-line). 10 July Allied forces invade Sicily in Operation Husky. Six weeks of fierce fighting would drive Axis (Italian and German) forces from the island, opening up the Mediterranean’s sea lanes. 12 July One of the greatest tank battle in history takes place at Kursk between the German Fourth Panzer Arms and the Soviet Red Army’s 5th Guards Tank Army. Expecting nothing more than a few anti-tank guns, the advancing German forces were surprised to find almost 1,000 tanks blocking their way. 16 July The start of the German withdrawal from Kursk. 17 July Rome receives its first major bombing raid of the war. 24 July The fascist Grand Council agree that military power in Italy should rest with the king, Victor Emmanuel. 25 July Mussolini is arrested. 28 July A bombing raid on the German industrial port of Hamburg results in a firestorm that kills more than 40,000 people. Almost 40% of Hamburg’s factories are destroyed. 3 Aug Italy signals the potential for a peace settlement with the Allies. 6 Aug German troops pour into Italy to stop any chance of a peace settlement that would take Italy out of the war. 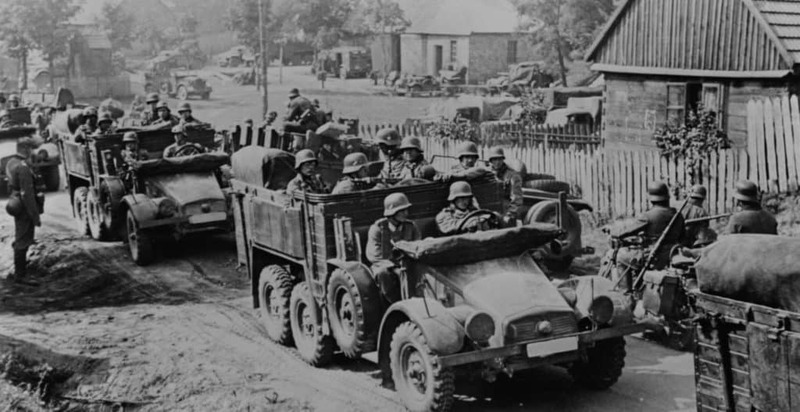 22 Aug The Germans begin to withdraw from Kharkov, the Russians enter the city the next day. 3 Sept British and Canadian forces under the command of General Bernard Montgomerry invade mainland Italy in Operation Baytown. 8 Sept The main Allied invasion of Italy is landed at a little town just south of Naples called Salerno. It was soon obvious that tactical surprise had not been achieved when the first wave of US forces ashore were greeted by a loudspeaker announcing in English “Come on in and give up. We have you covered.” Undeterred that attack continued. 25 Sept In Russia Smolensk is liberated. 1 Oct British troops enter Naples. 9 Oct The liberation of the Russian northern Caucasus is completed. 6 Nov German troops are forced out of Kiev. 20 Nov The Battle of Tarawa starts, which over the next four days will ultimately cause the death of over 1,000 US Marines. Out of 4,500 Japanese defenders, only one officer and sixteen enlisted men would surrender. 23 Nov The Japanese are driven out of the Gilbert Islands. 28 Nov Start of the Tehran conference. The meeting was the first time the so-called ‘Big Three’ met – Stalin, Churchill and Roosevelt, it set the direction for the rest of the war in Europe. 26 Dec The German battleship ‘Scharnhorst‘ is sunk north of Norway. Following a daylight dash up the English Channel from occupied France, the British battleship HMS Duke of York and her escorts intercept and sink the pride of the German Navy. Stalin, Churchill and Roosevelt at the Tehran Conference. Important events of 1940, including the beginning of the London Blitz and the Battle of Britain.